About eight inches long. Dark cinnamon brown with white streaks on upper parts and white with cinnamon brown streaks on underside. Buff white facial disk with black outline around yellow eyes. Three or four narrow white bands on the tail. Inhabits dense coniferous forests, groves and tree stands in farms and towns from the middle U.S. north to Canada and Alaska and in the southwest mountainous regions as far Mexico in the winter. 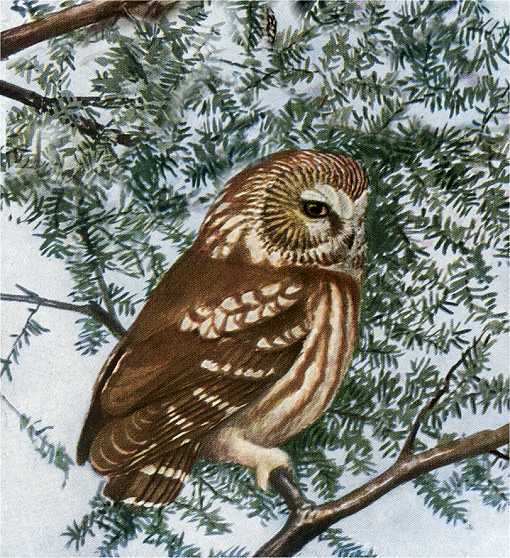 Like its cousin, the Boreal Owl, it inhabits the northern latitudes around the globe. Night hunter for mice and insects. Its note resembles the filing of a saw. Makes a nest of loose chips and feathers in natural or abandoned tree cavities, rock clefts, sometimes in abandoned squirrel, crow or heron nests, in building towers and in bird houses which have been used for hundreds of years for rodent control. Lays three to seven white eggs which hatch after about four weeks incubation and young leave the nest in another four to five weeks. The Saw-whet Owl Birdhouse (same as for Pigmy Owl, Lewis’s Woodpecker, Northern Flicker, and Grackle) has a 7″ by 7″ floor, 16″ inside ceiling, 2 1/2″ diameter entrance hole located 14″ above the floor and ventilation openings. Secure hinged roof with shutter hooks for easy access or consider a fixed roof and Side Opening Doors if it may be a more convenient and safer alternative. Mount this birdhouse out of reach (10 feet or higher) near woodland edges or clearings. Place a bed of wood chips, not sawdust, on the floor. Remove everything from the nest box and clean well after the brood rearing season. Other owls and woodpeckers also may use this nest box. About eight inches long. Dark cinnamon brown with white streaks on upper parts and white with cinnamon brown streaks on underside. Buff white facial disk with black outline around yellow eyes. Three or four narrow white bands on the tail.